It has been over a year and a half since I’ve written for my website. A lot has happened: My beloved Monty passed away (the reason for me to stop writing), I started a job as executive director of Canyon Concert Ballet, I traveled to five countries in Europe, adopted a terrier mix named Navi, grieved as my precious kitty Calliope passed away, and most recently I’ve adopted a cat named Mielikki. The loss of Montague and then Calliope pushed me away from the website while I grieved the loss of these two beautiful, loving, wonderful companions. They will forever be missed and remembered, and it is my hope to write a post for each of them in their memory and honor. I hope to start writing again… my heart is still heavy and I think of my missing fur babies every single day. But I want to carry on with talking about animal welfare issues, and other issues I am passionate about. Thank you for your patience while I took this sabbatical. I look forward to writing again! Hurricane Harvey and the incoming hurricane Irma are teaching us many things as a nation, including putting a spotlight on animal welfare organizations and their disaster plans (or lack there of). The hours following up to hurricane Harvey had cries of protest happening all over animal welfare social media as word came out that several shelters were euthanizing all their animals ahead of the storm. Other groups were rushing in to help evacuate or simply just take these group’s animals to avoid them being killed, abandoned, or put through the flooding with no idea if they could survive it. What this told me (and many others) is that too many animal shelters and wildlife sanctuaries do not have a disaster response plan in place. And that, in of itself, is absolutely tragic. Animals brought into the care of a facility are completely dependent upon that facility, and responsible care includes having a plan for when things go wrong. So, have a plan. If you are involved with an animal welfare group, ask what the plan is for flooding, fire, earthquake, tornado, etc. Even if a natural disaster is not common in your area, it’s still smart to have a plan for it. And there shouldn’t just be a plan written up and sitting in a binder to collect dust. That plan should be discussed at volunteer and employee trainings, and semi-annual practice runs should occur (keeping the animal’s safety and well-being in mind… maybe use stuffed animals to replicate the animals in your care so they are not being subjected to evacuations on a regular basis). It should be ingrained in your team’s minds what to do when disaster strikes. So in the horrible off-chance it does, you know what to do and how to help get yourselves and those in your care to safety. The answer is NEVER to euthanize them and is NEVER to leave them behind. A great plan that several shelters acted on in the Houston area was to reach out to partner shelters outside of the storm before it hit hit to have them take all their current animals so that they would be safe and that the shelter could then turn their focus on helping owned pets get to safety and reunite with their owners. So ask your local shelter or wildlife sanctuary what their disaster plans are. If they don’t have any, ask if you can help them prepare them. Get the local first responders involved to include their expert advice. There is no reason why an animal welfare group should not have a plan for when the worst happens. These animals are depending on these groups to keep their best interests in mind, and that includes having a plan for all major disasters. My heart goes out to all humans and animals affected by hurricane Harvey, and hurricane Irma. Please don’t evacuate without your pets and don’t forget to bring food, water, a leash/crate, and their vet records with you. 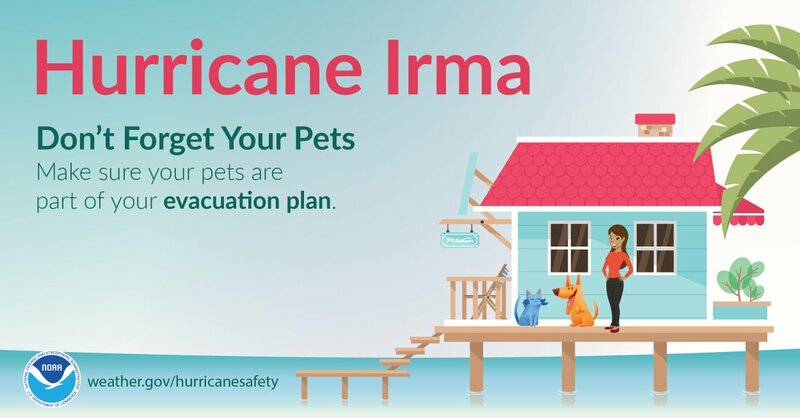 If you can, call ahead to the place you are evacuating to to make sure they allow pets. Most hotels will allow them during these natural disasters, but the Red Cross shelters typically do not (which is a total shame). Be smart and be safe! Like you, I have been haunted by the news and images that have been coming out of Texas this past week. I used to live in Austin, TX, and have many friends who are in that area, including Houston. Luckily, all my friends and coworkers are safe although some are still without power, have lost safe running water, and are still stuck while the flooded waters work their way out of the area. It may seem out of our individual, or even collective, power to do something about this devastation. But we can do something. I ask each of you to join me in supporting a cause or multiple causes that are on the ground, helping those who are facing loss. The aftermath of this destruction will take months, if not years, to recover from. So let’s show Texas our love and support. We can make a difference, we can help, so let’s do it. Here are a few charities that I know are on the ground, doing great work right now in Texas. Definitely feel free to research and find your own causes if none of these speak to you. Just make sure they are truly a 501c3 nonprofit organization (you can check if that is true here) and ask them/look into what they are doing with donations/what they are doing to help. Unfortunately there are a few outliers who are horribly taking advantage of this situation, so always do due diligence before making your donation! That’s right, this past Monday I drove up with my pup, Montague to see the total eclipse in Glendo, WY. It’s a two hour drive (when there is no traffic) to get there from Fort Collins, and they have a lovely state park that I figured would be the perfect spot. We left at 3am Monday morning, and while there were a good number of cars on the road, we made it to the Glendo State Park before 5:30am. They were parking people in a field, with a thick woods between the parking area and their reservoir. After a nap in the back of the car until about 8am, we trekked through the woods to find an almost empty beach by the reservoir. We set up lawn chairs and hung out, watching the birds and Monty ran around a bit, enjoying the lake and playing a little catch. The eclipse itself was an absolutely amazing experience. I had no idea what to expect, and it was beyond any expectation I could have had. I actually got a little teary-eyed when totality happened, and we could look directly at the moon with the sun’s corona shining around. It was beautiful. Totality was stunning, and the darkness it caused was astounding. The temperature also dropped over 20 degrees in a rather rapid manner which was pretty eerie! Below are my photos, and I included the totality photo from NASA since I didn’t bother taking a photo while it happened since it was only two minutes. I also took a video to try to capture how quickly the darkness came and went as it all when down. The wildlife, and Monty as well, definitely reacted to the eclipse. As the eclipse started, a lone deer ran frantically down the beach. We also saw a pack of coyotes on a nearby hill running somewhat scattered. The only birds we had seen or heard before the eclipse was a small flock of geese and two seagulls in the reservoir. Right before totality, as the darkness was coming on and the temperature had dropped almost 20 degrees, birds started coming out of the trees to do their dusk activities. We also spotted a major increase in insect activity close to totality as well. The drive home was the real adventure, though. While it usually takes two hours, and driving up that morning was only 2.5 hours, the return drive took over 10 hours that afternoon. Luckily we had packed a cooler with drinks and food, and with good A/C we were able to keep Monty as cool as possible in the summer heat. We also spotted 26 different license plates on the slow crawl home. All in all, it was an amazing experience that I would definitely do again! The next total eclipse for the United States will be in 2024, running from Texas to Maine. Mark your calendars and I’ll see you out there! Summer is a great time for vacations, adventures, and long walks with your pups. It’s warmer out, there is more daylight, and it just feels right to be outside. Having your pup be part of these outdoor adventures is a great idea, but it’s always good to keep in mind some precautions while out and about. Yard chemicals are unfortunately a real thing many of your neighbors probably use. You have most likely noticed the little warning flags sticking out of the corners of their yards, and those flags are warning you to keep your children off the lawn. That also applies for your dogs! Their feet will pick up those chemicals, and that not only gets into their systems which can cause some major health issues, but they will also track those chemicals back into your home. I try my best to avoid letting my pup walk on anyone’s yard since not everyone even displays those little warning flags and I would invite you to do the same to help keep them safe! The hot sun means the pavement on roads and sidewalks are hot, too. Place your hand on the ground you plan to walk on – if it’s too hot for your hand, it’s too hot for your pup’s paws. Consider booties for their feet or try to find grass to walk on instead! Wildlife is out and about too, so make sure to keep your dogs on leash unless in a designated off-leash area to keep them under control and away from getting into a scuffle or a bite. Keeping cool is also important. Don’t forget that your pup cannot sweat, so they can overheat easily. Have lots of water handy, and try to take advantage of shade when you can. Always be aware of your pet’s well-being during your adventures, and don’t push them too much in this summer heat! Have fun on your summer adventures! As for us, Montague and I plan to attempt a 14er here in Colorado next week in celebration of his 11th birthday. We’ll pack tons of water, take our time, and also have some snacks along the way to keep ourselves safe. Wish us luck! Happy summer and enjoy the adventures! I have always been a huge fan of Renaissance Faires. They have great energy, fun entertainment with comedy shows, music, jousting, etc, and beautiful crafts to look at and buy. It’s been a tradition to attend Ren Faire every summer since I was a kid when my family would take us down to the WI/IL border for the Bristol Renaissance Faire. It was always a highlight of the summer! So here in Colorado, I naturally looked up if and where they have a Ren Faire here. Luckily, there is one that happens in beginning of summer in Larkspur, a small town between Denver and Colorado Springs called the Colorado Renaissance Festival. Unfortunately, this Festival uses animals for children’s rides and petting area, including having elephants and large cats. I am beyond disappointed they feel the need to have these animals at this event. The presence of hooks by the handlers and the elephant’s general appearance both speak to their neglect. And all for what? So a child can say they rode one? There are so many other, humane (non-animal) rides a Ren Faire can provide that would have the same lasting impression on a child. Seeing the elephants, camels, and llamas being ridden by children, seeing the “exotic cats show”, and seeing the random assortment of animals in the “petting zoo” ruined the day for me. There is nothing fun, entertaining, or positive about seeing animals forced to be ridden all day long in the heat nor the animals forced to stay in small pens all day in the heat with children “petting” them, nor the exotic cats being forced to perform. It disgusts me that the organizers of this otherwise wonderful event approve and support this type of animal use and abuse. In an age where even the circus has phased out using animals, one would think a progressive organization would want to also phase out animal abuse and instead focus on humane entertainment. I plan to write to the organizers of the Colorado Renaissance Festival, and I encourage you to see if your local Faire/Festival uses animals and, if they do, join me in writing to them to encourage them to stop this abuse. Trap/Neuter/Release Programs – if the shelter has a TNR program, they are BUSY right now. Summer is the “busy” season for animals who are feral (or possibly stray). Their food sources are active, it’s the time to mate, and the weather makes it easier for them to be out and about. Traps are filling up quick this time of year, and surgical rooms are packed with animals getting fixed. Fireworks/summer thunderstorms – summer brings about a lot of activity, including the mid-summer fireworks and lots of summer storms. Both can be upsetting for pets, who may spook enough to run away from home. The day after the Fourth of July is actually notorious for being the biggest day of stray intake for shelters. Make sure to check local shelters regularly if you loose a pet, and check the entire area, not just your one town. Spooked animals can go pretty far when they get lost. “Kitten Season” – summer also brings about kittens. Lots of them. Cats breed around the same time, bringing about ALL the kittens starting in May each year. That number just keeps rising until the weather cools off, so shelters are getting packed with cats and kittens this time of year. Guaranteed your local shelter is doing some kind of adoption special on cats right now, because they have so many that need homes and they need to make room for more. Loose Pets – when the weather gets better, people tend to not contain their pets as much. Less leashes, more running down trails, and more letting them outside without keeping an eye on them. Unfortunately, this leads to more strays as pets can spook, chase something, or just get lost and don’t know how to get home. And with cats, people tend to not look for them when they don’t come home (which is super tragic… many lost cats DO end up at a shelter, but rarely do they get reclaimed). This leads to more animals in their stray hold, and more animals up for adoptions when they don’t get reclaimed. So, the lesson to be learned here is: if you were thinking of adopting a pet, volunteering at your local shelter, maybe supporting them with a donation… now is the time to do it! Shelters and rescues across the country need YOU to support them while these crazy summer months are happening. Get out there and help!